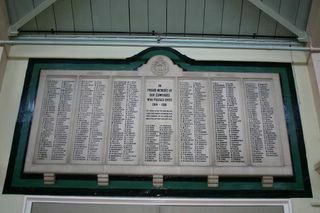 A series of 7 Portland Stone panels giving the names of the Isle of Wight Rifles soldiers who died in the Great War. Unveiled by HRH Princess Beatrice on 1st October 1922. Note : the lists below are taken from that published by the Isle of Wight County Press 7th October 1922. This list also gave the residences and place of death of the soldiers mentioned. See also the Isle of Wight Rifles Memorial at Carisbrooke Castle.